FIND YOUR COMMUNITY NEWS HERE! Find Great Arts & Cultural Events Inside! CITY SUBURBAN NEWS 610-667-6623 www.issuu.com/ CitySuburbanNews LIKE us on Facebook! CITY SUBURBAN NEWS OFFERS AFFORDABLE ADVERTISING SOLUTIONS. Reach Your Community Here! Publishing Every Wednesday PRINT & ONLINE. 34 Years of Loyal Advertisers & Readers. Let Us Help You Brand Your Business! Call 610-667-6623 or email: CitySuburbanNews@mac.com to reserve your space. We can easily email info and custom design your ad for FREE! Advertise in City Suburban News to Reach Your Customers! CITY SUBURBAN NEWS – Your Community Paper for 34 Years! Find Great Events to Attend in Every Issue! NEED TO SELL ITEMS? Advertise in Our Classified Section! Call 610-667-6623 to place your ad! Payable to: CITY SUBURBAN NEWS, in check, money order or charge. EVEN MORE EVENTS “We Shall: A Lyrical MLK Celebration” “We Shall: A Lyrical MLK Celebration” is an engaging intermingling of spoken word, singing and instrumental music paying tribute to one of America’s greatest citizens and thinkers, Rev. Dr. Martin Luther King Jr. Utilizing brief excerpts from King’s speeches and sermons as inspiration and a combination of Gospel, Jazz and Blues music, this piece explores the inner workings of a mind and body in struggle. This performance takes place on Saturday, January 19, 2019 at 3 p.m. at the Museum of the American Revolution, 101 S. 3rd Street, Philadelphia, PA 19106. This Performance is free with Museum Admission. (Admission: $21 for Adults; $18 for Students, Seniors, Active & Retired Military; $13 for Children 6 & up). Visit www.philajazzproject.org for details. Phila. Young Musicians Orchestra Concert The Philadelphia Young Musicians Orchestra (PYMO) will perform at The Temple Performing Arts Center, located at 1837 N. Broad Street in Philadelphia, on Saturday January 19, 2019 at 4 p.m. An ensemble of the Philadelphia Youth Orchestra, the PYMO concert will feature a variety of classical music selections under their distinguished conductor and director, Kenneth Bean. Featured compositions will include Rossini’s Overture to “The Barber of Seville,” Vaughn-Williams’ English Folk Song Suite, Dvořák’s Slavonic Dance No. 1, Op. 46 and Haydn’s Symphony No. 104. This is a free event. For information, call 215-545-0502. MLK Day Address at Philadelphia Ethical Society In honor of Martin Luther King, Jr. Day, Hugh Taft-Morales, Leader, Philadelphia Ethical Society speaking on “The Weight of History,” will discuss how the horrific damage done to people and communities of color due to white supremacy can paralyze many who support campaigns for social justice, 11 a.m., Sunday, January 20, at the Society 1906 S. Rittenhouse Square. All are welcome. More info at office@phillyethics.org or 215-7353456 or visit the PES website at www.phillyethics.org. Valley Forge Chapter of the American Rhododendron Society Lecture At Jenkins Arboretum join Peter Zale, Ph.D., Associate Director of Conservation, Plant Breeding, and Collections at Longwood Gardens, for a photographically rich presentation detailing the uses of rhododendrons at Longwood Gardens, and his own experience with rhododendrons in the field and in his garden. This presentation will be held Sunday, January 20, at 2 p.m. Free of charge. All are welcome. Pre-registration is required. Visit www.jenkinsarboretum.org. The Philadelphia Orchestra Presents Annual Martin Luther King, Jr., Tribute Concert at Girard College The Philadelphia Orchestra, in partnership with Girard College and Global Citizen’s Greater Philadelphia Martin Luther King Day of Service, is proud to present its 29th annual Martin Luther King, Jr., Tribute Concert held at the Girard College Chapel on Monday, January 21, at 1:30 p.m. Led by Music Director Yannick Nézet-Séguin, the concert concludes the Greater Philadelphia Martin Luther King Day of Service, the largest King Day of Service event in the country. Tickets to the concert are free at www.philorch.org. Seating will be general admission and is first-come, first-served. Tickets do not guarantee entry and there is a limit of four per household. Doors will open at 1 p.m. The concert is generously presented by PECO and will be broadcast live on WRTI 90.1 FM. Dance Fitness Class On Wednesday, January 23 at 1 p.m., Betsy Klausman leads a new Dance Fitness Class at New Horizons Senior Center. Dust off your dancing shoes. Learn easy dance steps to Latin music while getting some fun exercise. No partner required. Just bring comfy shoes! Interested parties can stop by New Horizons Senior Center to a make an appointment, 100 Conway Avenue, 2nd floor or call 610-664-2366. Come early (at noon) to enjoy a catered lunch provided by Betty the Caterer for a suggested donation of only $2. The Delaware Country Symphony (DCS) performs the third concert of their 2018-2019 chamber music series on Sunday, February 10 at 3 p.m. at Neumann University in Aston, PA. The concert features music for the DCS Brass Quintet, Percussion instruments and also the Woodwinds in the elegant “Concertante for Two Clarinets” by Franz Tausch. The concert is under the baton of Dr. Robert Whalen Director of the DCS Chamber Music series. Concert tickets are $15 or $12 for seniors/students. Children under 12 (one child per paying adult) are admitted free. Upon presentation of the Delaware County or Montgomery County Library card two tickets may be purchased for the price of one regular admission ticket the day of the concert. There is ample free parking adjacent to the theatre and the Life Center is handicapped accessible. For information call 610-8797059 or visit www.dcsmusic.org. Shown is Heidi Streich on Tympani. delphia’s Kimmel Center for the Performing Arts on Sunday, January 27 at 3 p.m. Diverse voices harmonize in this concert portrait of American life and experience, entitled American Images. Signature works by Aaron Copland and Charles Ives – the Pulitzer Prize-winning “Appalachian Spring” and “The Unanswered Question” – paint a picture of our nation’s emerging musical vernacular in the 20th century inspired by traditional hymns, folk songs, and the transcendental movement. They frame the Philadelphia premiere of the Tuba Concerto by award-winning Curtis faculty and alumna Jennifer Higdon (’88), one of today’s most widely performed composers, who creates a virtuosic showcase for Curtis tuba faculty and alumnus Craig Knox (’89). The program closes with the haunting Symphony No. 7 by Antonín Dvořák, a champion of Czech folk music who went on to become America’s most celebrated immigrant musician of the 19th century. Conducting fellow Yuwon Kim conducts the work by Ives; Curtis alumnus Mark Russell Smith (’87) takes the podium for the works by Higdon, Copland, and Dvořák. This program represents a unique homecoming for performers Smith and Knox and composer Higdon, who all attended the Curtis Institute of Music together. Single tickets to the Immaculata University concert for $20 are available from the Curtis Patron Services Office at 215-893-7902 or www.Curtis.edu/ Performances. Single tickets to the Verizon Hall concert start at $25 and can be purchased through the Kimmel Center Box Office at 215-893-1999 or www.KimmelCenter.org. This concert is supported by the Jack Wolgin Curtis Orchestral Concerts Endowment Fund. World and National Affairs Discussion Group New Horizons’ World and National Affairs Discussion Group takes place on Mondays (closed Monday, January 21 for MLK day). Next one is January 28 at 1 p.m. Historians Robert and Susan Bond lead a lively discussion of current events. Participants are invited to bring articles on current events of interest to discuss and offer their response. All views and political orientations are welcome! Interested parties can stop by New Horizons Senior Center to a make an appointment, 100 Conway Avenue, 2nd floor or call 610-664-2366. Come early, and enjoy a catered lunch provided by Betty the Caterer for only $2. Thanks for Reading City Suburban News Every Week! Must receive ad and prepayment by noon Friday. All classified ads must be prepaid. Visa/Mastercard preferred. FAX this to: 610-667-6624 & we will call you for credit card. o Call me for credit card info. Something terrible happens when you don’t advertise... NOTHING! Email your formatted events to: CitySuburbanNews@mac.com Events for consideration need to be submitted 2 weeks prior to publication date. Information submitted should include name of the sponsoring group, the activity, time, location, reservation deadlines and phone number – all in full sentences, in paragraph format, (upper and lowercase please). Short and sweet works well! Plus print-quality jpg photos are welcome. Call us if you have questions: 610-667-6623. Thanks! All ready-to-use events & attached print quality photos (jpg) 200 dpi min. must be emailed! as a middle school student to pursue music after attending one of the original BC Library concerts directed by Sylvia Glickman herself. The ensemble strives to be an international leader in connecting diverse audiences with the greatest music of the 20th and 21st centuries, particularly works by Philadelphia composers. Orchestra 2001 has performed in New York, Denmark, England, on five tours to Russia, at the Salzburg Festival, the Havana Festival of Contemporary Music, as well as Abu Dhabi, Dubai, and Qatar. Most recently, the ensemble has been featured at festivals and venues in Beijing, Hong Kong, Shanghai, and Tianjin. Collaborations have ranged from a Renaissance band to an Indonesian dance troupe and gamelan to a gospel choir. The ensemble has produced 19 commercial recordings. “This concert will bring wonderful music to those who might not otherwise hear it,” says Hodos. “This program highlights the outstanding diversity and depth of music by women who grew up and live in our own immediate area. I’m really looking forward to enjoying it.” “Women’s Movement” will be performed on Sunday, January 27 at 2 p.m. at the Levering Mill Tribute House, 382 Bala Avenue, at Levering Mill Road, in Bala Cynwyd. Admission is free. For information, call 610-664-1196.
and exciting opportunities at every turn. She is confident that her career successes came through the understanding that there is no greater power than teamwork and the value and security that it provides. She makes a point to express that she learned leadership from the very best military colleagues, NASA bosses, healthcare greats, and important mentors, that included both men and women. Dr. Seddon is confident in stating that in addition to providing a way to study human adaptation and see glorious views of planet Earth, spaceflight taught her a myriad of important life lessons that we can teach and inspire us all. A woman of many firsts, Dr. Seddon’s careers spans multiple professions including medicine, aeronautics, and business management. All three professions were male-dominated during her tenure. She has been inducted into the Tennessee Aviation Hall of Fame, the U.S. Astronaut Hall of Fame and the Tennessee Women’s Hall of Fame. She is a national speaker and award-winning author who today encourages young and old alike to Go for Orbit and reach for the stars. SPW Trademark Events typically range from 150-250 attendees, and includes valuable networking opportunities prior to and at the conclusion of the program. For information and to purchase tickets, visit www.spwmainline.com. atre is thrilled to bring a classic to the company through Marcantel’s new adaptation. He says, “Saint Joan is more relevant today than we might imagine. The original Shaw play has a huge cast and deals with many male influences. I wanted to make this play more about Joan and what drives her as well as her fears and doubts. The smaller cast and narrower focus makes it a powerful play with more energy, exciting movement, and an impactful message. Because of the new script, the show has the ability to be more theatrical in its look and feel.” Clare O’Malley leads the production as Joan of Arc herself. O’Malley, a DTC audience favorite, first came to Martin’s attention when he held auditions for “Hetty Feather.” He said, “I think that Clare is magical when she is on stage, and when I was thinking about picking a classic for this season, I thought it was the perfect opportunity to bring her back.” In addition to O’Malley, the cast features Philadelphia powerhouses including Mary Martello as Lady Warwick; Tai Verley as Saint Catherine; Mary Tuomanen as Saint Margaret; Dan Kern as Archbishop and the Inquisitor; Sean Michael Bradley who will serve as the show’s Fight Choreographer in addition to playing Poulengey, Dunois, and Ladvenu; Charlie DelMarcelle as Baudricourt, Bluebeard, and Cauchon; and Michael Doherty as Charles the Dauphin, Stogumber, and D’Estivet. The design team is comprised of Colin McIlvaine (Scenic Designer,) Millie Hiibel (Costume Designer,) Thom Weaver (Lighting Designer,) Michael Kiley (Sound Designer,) and Nick Hussong (Projection Designer.) Performances are held on Delaware Theatre Company’s stage, located at 200 Water Street in Wilmington, DE, just feet from the beautiful Riverfront. “Saint Joan” runs February 6 - 24, 2019. Tickets are on sale now starting at $25 and can be purchased online at www.DelawareTheatre.org or by calling the Box Office at 302-594-1100. DON’T IGNORE YOUR TEETH. CALL US TODAY FOR: • Preventative care • Treatment of Gum Disease • Cosmetic Dentistry: bonding, veneers, tooth whitening • Crowns and bridges, dentures • Root canal treatment • SAFE SEDATION DENTISTRY Nitrous Oxide Gas is available Graduate of the Univ. of Penn. CITY LINE OPTICAL FAMILY V ISION C ARE Eye Examinations • Contact Lenses • Most Insurance Accepted Full Range of Eyewear, including designer City Line Professional Building 7516 City Avenue, (Behind CVS), Phila., PA 19151 • 215-878-7181 Amy N. Fox, O.D. Michael A. Karliner O.D. Let Your Business Grow in City Suburban News! Call 610-667-6623 for Great Solutions to Reach Your Customers! Check engine or other warning light? Performance issues? Other issues? to a maximum of $200. EVERY WEEK FIND GREAT ADVERTISING OPPORTUNITIES IN CITY SUBURBAN NEWS! Call 610-667-6623 today to reach your customers! Visit us at www.shoparmen.com for additional money saving coupons. Support Your FREE Community Newspaper – Advertise Your Business or Organization Here! he Arts Guild at Neumann University prepares for another trip around the world with the annual arts fundraiser, “Evening In.” This year the trip takes guests to the bright lights of Las Vegas in an elegant black-tie celebration Friday, January 18, 2019 at 7 p.m. This year’s event features a full range of entertainment from the Delaware Country Symphony, International Ballet Classique, Center Stage Productions and a special guest appearance from Elvis impersonator Jay Allan. Allan has performed throughout the U.S. and Canada, featured in commercials for MTV and appeared on CNN and VH-1’s Rock of Ages. The black-tie celebration will feature Vegas-inspired foods as well as casino games for great prizes. Ticket holders are eligible for the grand prize of round-trip airfare and lodging for two to Las Vegas, Nevada. The Arts Guild at Neumann University was established in 1991 to enhance the high level of cultural enrichment presented to the Delaware Valley community. The eight member organizations – Center Stage Productions, the Cultural Arts Forum, the Delaware County Symphony, International Ballet Classique, the Neumann University Arts Gallery, the Neumann University Concert Chorale, the Neumann University Jazz Band, and the Neumann University Players – offer performances and seminars in the Fred P. Meagher Theatre in an atmosphere that provides fine acoustics, architectural excellence and comfortable, continental seating. Event will be held in the Thomas A. Bruder, Jr. Life Center at Neumann University. For ticket information or to RSVP e-mail dimarinn@neumann.edu or call 610-558-5626.
tate Rep. Pamela A. DeLissio, D-Montgomery/Phila., will hold her 80th Town Hall meeting at 10 a.m. Saturday, January 26 at Cathedral Village, 600 E. Cathedral Road, 19128. At this “Pam Unplugged” gathering, DeLissio said, “I look forward to sharing with constituents my involvement over the past few months to change the House Rules, which is an underlying reason for much of the unfinished business in Harrisburg. The House Rules also contribute to how the ‘cards’ end up stacked not in favor of citizens, but in favor of special interest groups with significant financial influence. “As a result of important unfinished business session after session, there has been a focused effort to ensure that the Pennsylvania House Rules provide a fair and square opportunity for legislation such as redistricting reform and updating and improving our voting systems and campaign finance reform, etc. to reach the governor’s desk,” DeLissio said. Pennsylvania is ranked very low when it comes to legislative fairness. “This town hall will be an opportunity for constituents to hear how state government works in reality, instead of in theory, and what some of us are doing to instill oversight and change. Our goal is a fair and square government in 2019-2020,” DeLissio said. DeLissio’s stated goals for her Town Halls include informing constituents about how the legislative process works. “The more citizens understand about the process, the better they can participate and advocate. It is always exciting to share my experience of how the process works, or in some cases does not work.” More information can be obtained by calling DeLissio’s office at 215-482-8726 or visiting www.pahouse.com/DeLissio. Barber and Gian Carlo Menotti. Graham’s groundbreaking style grew from her experimentation with the elemental movements of contraction and release. By focusing on the basic activities of the human form, she enlivened the body with raw, electric emotion. The sharp, angular and direct movements of her technique were a dramatic departure from the predominant style of the time. The Martha Graham Dance Company has been a world leader in the development of contemporary dance since its founding in 1926. Today, under the direction of Artistic Director Janet Eilber, the Company is embracing a new programming vision that showcases masterpieces by Graham alongside newly commissioned works by contemporary artists. With programs that offer a rich thematic narrative, the Company creates new platforms for contemporary dance and multiple points of access for audiences. Though Martha Graham herself is the best-known alumna of her company, the ensemble has provided a training ground for some of modern dance’s most celebrated performers and choreographers. Former members of the Company include Merce Cunningham, Erick Hawkins, Paul Taylor, John Butler and Glen Tetley. Celebrities who have joined the Company in performance include Mikhail Baryshnikov, Margot Fonteyn, Rudolf Nureyev, Maya Plisetskaya, Tiler Peck, Misty Copeland, Herman Cornejo and Aurelie Dupont. In recent years, the Company has challenged expectations and experimented with a wide range of offerings beyond its mainstage performances. It has created a series of intimate in-studio events, forged unusual creative partnerships with SITI Company, Performa, the New Museum, Barney’s and Siracusa’s Greek Theater Festival (to name a few); created substantial digital offerings with Google Arts and Culture, YouTube and Cennarium; and created a model for reaching new audiences through social media. The current company of dancers hail from around the world and, while grounded in their Graham core training, can also slip into the style of contemporary choreographers like a second skin, bringing technical brilliance and artistic nuance to all they do. Dance Affiliates, renamed NextMove Dance, is recognized as one of the nation’s finest dance presenters. Known internationally for award-winning presentations for almost four decades, NextMove Dance provides a wealth of opportunities for the Delaware Valley community to interact with the artists through talk-backs, master classes, artistic collaborations, workshops, children’s programs and much more. Visit www.nextmovedance.org. Annenberg Center Live and NextMove Dance present the Martha Graham Dance Company in the EVE Project, Friday, January 25 (8 p.m.) and Saturday, January 26 (2 p.m. and 7 p.m.). The program features the Philadelphia premiere of Graham’s powerful Chronicle. New Horizons Senior Center New Horizons Senior Center, a local community resource for active adults 55 and older, is located in the hub of Narberth, at Narberth Borough Hall, 100 Conway Avenue, 2nd Floor. Since 1976, New Horizons has been providing a wide array of programs and services to appeal to the interests, talents, and desires of local seniors, keeping them active, engaged, and independent. In January, New Horizons is open Mondays, Wednesdays and Thursdays, (closed Monday, January 21 for MLK day) For info, resources and news, visit www.newhorizonsseniorcenter.org or call 610-664-2366 to sign up for an upcoming event. Display advertising deadline is the previous Thursday. Classified deadline is Friday at noon. City Suburban News reserves the right to edit, reject and classify all editorial copy and advertising copy. Any article or advertising that appears in City Suburban News does not necessarily reflect the view of the publisher or staff. Please bring it to our attention if there is a typographic error. The customer must bring it to our attention if there is an error so it may be corrected. We will not be responsible after the 1st week! To conveniently receive City Suburban News every week through the mail, please send $65 with your mailing address to the above address. You will receive 50 issues for your oneyear subscription. Thanks for reading! O U T - A N D - A B O U T – Dining & Entertainment News By Jerry H. Bloom, Staff Writer On Stage • Fine Art Music Company, at Ivy Hall, International Institute for Culture, 6331 Lancaster Avenue in Philadelphia, presents War of the Romantics, Part 1: Musical Raptures, Saturday, January 26, 7:30 p.m., (and at the Philadelphia Fine Art Music Company, at Ivy Hall, International Institute for Culture, 6331 Lancaster Avenue in Philadelphia, presents “War of the Romantics, Part 1: Musical Raptures,” Saturday, January 26, 7:30 p.m., and at the Philadelphia Ethical Society, 1906 South Rittenhouse Square in Philadelphia, on January 27. Adelya Shagidullina, violin and Rollin Wilber, piano are shown in a prior concert at Ivy Hall. Ethical Society, 1906 South Rittenhouse Square in Philadelphia, on January 27). This is the first of a two-part concert series (Part II scheduled March 30 - 31). This series will offer an innovative approach that marries classical music with theater. For tickets ($27, $22 for seniors, $10 for students) and info, call 215-803-9725, or visit www.fineartmusiccompany.ticketleap.com. • Paris Bistro, 8229 Germantown Avenue in the Chestnut Hill section of Philadelphia, presents Bruce Klauber, vocalist, drummer, author and columnist, bringing his iconic Swings Frank Sinatra on Friday, January 18, at 7, 8:30 and 10 p.m., also featuring master jazz performers Dave Hartl (piano), Andy Lalasis (bass) and drummer Michael Nigro, Sr. For reservations or info, call 215-242-6200 or visit http://parisbistro.net/music. • Sellersville Theater, 24 West Temple Avenue in Sellersville, PA, presents Three Band Blues & Brews Concert featuring the Dukes of Destiny on Friday, January 18, doors 7:30, show 8 p.m. This three-band concert also features the Greg Sover Band and the Deb Callahan Band, offering a night of great music, high energy and fun. For tickets ($21.50 Advance; $30) call 215-257-5808 or visit https://theater.st94.com/events/blues-brews-ft-dukes-of-destiny-greg-sover-band-deb-callahan-band. Food News • Sedition Bar & Restaurant, 727 Walnut Street in Philadelphia, is one of the largest underground restaurants in Philly with exposed brick, arches and cozy nooks. Chef Rafael “Raff” Rodriguez’s new winter menu offers Small Plates: Fried Brussels with fennel, pomegranate, sherry vinaigrette, goat cheese, pickled onion ($8); Chicken Liver Toast with frisée endive salad, luxardo cherries, pickled onion, sour dough ($9); Wings with hot sauce brined, stilton bleu cheese, carrot, celery ($12) and Grilled Octopus with papas bravas, romesco, chorizo, escabeche ($13). New entrees: Grilled Pork Loin with spaghetti squash, fingerlings, brussels sprouts, pickled cabbage ($21); Grilled Tuna with quinoa, chioggia beets, tomato, chervil, pomegranate, blood orange ($22); and Flank Steak with roasted peppers, red onion, basil, oyster mushroom, manchego, garlic mash ($23). For reservations or info, call 215-391-1100 or visit www.seditionphilly.com/reservations. 610-771-0101 • MANNYSPLACE.COM THANKS FOR READING CITY SUBURBAN NEWS EVERY WEEK! Advertise Your Valentine’s Day Specials in City Suburban News! Reach Your Community Here! Find Great Upcoming Events Every Week! The Board of Trustees of Merion Mercy Academy has announced the appointment of Laura Farrell as its next Head of School, effective July 1, 2019. M AIN L INE M ARTIN L UTHER K ING A SSOCIATION H OLDS A NNUAL MLK D AY P ROGRAM AND T C OMMUNITY S ERVICE P ROJECT he Main Line Martin Luther King Association will hold its annual MLK Day program on Sunday, January 20, at 3 p.m. The event will be held at Bryn Mawr College’s Goodhart Hall, 150 N. Merion Ave., Bryn Mawr, PA, 19010. This event is free and open to the public. Parking is available in a number of campus lots and a shuttle van will be operating from the lots to Goodhart Hall. The event features a musical tribute to Dr. King. Performers include the St. Thomas Gospel choir of African Episcopal Church of St. Thomas, Walt Blocker, music director; the acapella group Vision for God, and the Main Line Youth Freedom Singers Patricia Morales, director. Diana Robertson, president of the NAACP Main Line branch, and Phoenixville Area School District Orchestra Teacher Shawn Lee will be honored for making Dr. King’s dream a reality on the Main Line. The recipients of the association’s 2018-19 scholarships will also be introduced. Pennsylvania Superior Court Judge Carolyn H. Nichols will serve as the event emcee. On Monday, January 21, from 10 a.m. until noon, the association will hold a community service project at Bethel AME Church, 50 S. Merion Ave., Bryn Mawr, PA, 19010. Participants will be packing up toiletries to be distributed to area homeless shelters. All are welcome to participate and there will be workshops for toddlers and kindergartners during the community service project. A light lunch will be served following the event and six-year-old Chasiti Shuler, a first grader at Collegium Charter School, will be honored for her “Chasiti’s Beads for Cures” project to raise money for St. Jude’s Children’s Hospital. Donations of toiletries are being accepted at the church until 9:30 a.m. on January 21. Penn Lecturer/Emmy Award-Winning Producer to Lead Weekly University of Pennsylvania Community Outreach Project he Ardmore Library, a branch of the Lower Merion Library System, announced a partnership with the University of Pennsylvania’s Community Outreach Project, part of its Critical Writing Program, to assist local residents in common writing tasks. Ardmore is the latest library to join the project to help neighborhood residents needing assistance with writing and correspondence for such items as resumes, letters, thank you and condolence cards, completing forms and other efforts (legal and financial documents excluded). Jane Quin, Head Librarian of the Ardmore Library, adds, “We are thrilled to launch this important service to our local communities. It offers people of all ages important assistance that will help them in both their personal and professional lives.” “This partnership between our Critical Writing Program and the local Ardmore Library is another extension of our efforts to bring the university’s expertise into local communities for the betterment of local residents,” adds Val Ross, Director of the Critical Writing Program at Penn. “It adds to our already-existing partnership with the Philadelphia Free Library and several of its branches.” Leading the Ardmore project is Lecturer Jo Ann Caplin, a Main Line resident and 10-year member of the University of Pennsylvania Critical Writing Faculty. Caplin, an Emmy Award winning network news producer, first came to Philadelphia from New York City in the 1990s to be Executive Producer of The Bulletin with Larry Kane, the long-running popular news magazine program produced by Westinghouse, which aired on KYW-TV, Channel 3. Started by the University of Pennsylvania Critical Writing faculty, the program will be offered every Thursday in Ardmore from 4 to 6 p.m. starting on January 17. The Ardmore Library is located at 108 Ardmore Avenue, in Ardmore. For information, call 610642-5187 or visit https://www.lmls.org/locations-hours/ardmore-library/. Or contact Jane Quin, jquin@lmls.org. FA i T h • C h A r A C T E r • A C A D E M i C S WALK IN WEDNESDAYS • 9 a.m. - 11 a.m. ADVERTISE YOUR ARTS & CULTURAL PROGRAMS HERE! Call 610-667-6623 today to reach your audience! RSVP Philadelphia recently hosted a special thank you breakfast for its volunteer drivers and food packers in its Subaru Share The Love Home Delivered Meals program at KleinLife, located at 10100 Jamison Avenue in Northeast Philadelphia. At the event are, front row, from left – Sol Stark, Ginny DeLeon, a financial assistant at Colonial Subaru Volkswagen in Feasterville, PA, Sara Weingram, Loretta Katz and Janet Silbert; back row, from left – Don Rosensweig, Barry Weisberg, Jay Lipschutz, Howard Rothman, Ronne Hellmann, June Feith, Julie Borsky, KleinLife director of community services, Barnett Ellis, Howard Dyner, John Eskate, director of RSVP Philadelphia who oversees the Home delivered meals program in cooperation with KleinLife, Hank Walens, Dan Goldberg and Inna Gulko, KleinLife director of support services. The drivers and packers were being saluted for the thousands of hours they donated to provide some 70,000 home delivered meals for area seniors in Philadelphia, Bucks and Montgomery Counties who cannot shop or cook for themselves. Subaru of America donated $250 for every new or leased Subaru through January 2, 2019 to the customer’s choice of participating charities including Meals on Wheels America which KleinLife is a member. KleinLife can be reached at 215-698-7300 or on the web at www.kleinlife.org. by fossils or living animals, continue to inspire us today. “Mythic Creatures: Dragons, Unicorns and Mermaids,” opening this winter at the Academy of Natural Sciences of Drexel University, traces the natural and cultural roots of some of the world’s most enduring creatures of myth. Opening Saturday, February 16, “Mythic Creatures” features unique cultural objects that highlight the surprising similarities and differences in the ways people around the world have envisioned and depicted mythic creatures. Organized by the American Museum of Natural History in New York, “Mythic Creatures” includes imaginative models and cast fossils of prehistoric animals to investigate how they could have – through misidentification, speculation, fear or imagination – inspired the development of some legendary creatures. “C ITY B ETWEEN T WO R IVERS – W OODBLOCK P RINTS BY J ENNIFER M ANZELLA ” E XHIBIT The Black Moth Gallery presents “City Between Two Rivers – Woodblock Prints by Jennifer Manzella” for its first exhibition of the year. This solo show will be on view January 2 - January 30. This latest series of prints presents inverted skylines that depict remnants of industry and architecture along the Delaware and Schuylkill rivers in Philadelphia and along the riverways in New York City. This particular series of multiple wood block prints represent the human desire to reconstruct the environment, especially in cities. These altered urban landscapes are evidence of the actions to transform, destroy, and exploit what was there before. Colorful overlapping silhouettes form inverted skylines depict remnants of industry and architecture on the waterways of Philadelphia, inspired by the Delaware and Schuylkill rivers in Philadelphia as well as the New York City river ways. Gallery hours are Tuesday through Sunday 12-8 p.m. The exhibit is free and open to the public. Black Moth Tattoo and Gallery is located at 18 East Lancaster Avenue, Ardmore, PA 19003. For info call 610-642-1500. Visit www.BlackMothTattooandGallery.com. Shown is Jennifer Manzella’s “Riverways 2,” multiple woodblock print, 2018. People around the world tell of water creatures that are half-fish and half-human. Mami Wata is one of the most popular – and powerful – African water spirits. See her in “Mythic Creatures: Dragons, Unicorns and Mermaids,” February 16 - June 9, 2019. Photo/© AMNH For example, visitors will discover how narwhal tusks were believed to be magical remnants of unicorns, how dinosaur fossils may have been mistaken for the remains of griffins, and how tales of sea monsters may simply have been sightings of real creatures such as the giant squid. Exhibit highlights include a: • Vibrant sculpture of the African water spirit Mami Wata. • Replica “Feejee mermaid” of the type made famous by showman P. T. Barnum, created by sewing the head and torso of a monkey to the tail of a fish. • “Life-size” model of a European unicorn. • Dramatic model of a kraken, whose tentacles appear to rise out of the floor as if surfacing from the sea. Interactive stations invite visitors to: • Rearrange scale models of mammoth bones to look like a giant human skeleton. • Build their own dragon and watch as it comes alive in a virtual environment. • Watch video interviews with experts highlighting the significance of mythical creatures and their possible real-life counterparts. “Mythic Creatures: Dragons, Unicorns and Mermaids” will be on view through Sunday, June 9, 2019. Old City Jewish Art Center – 119 N. 3rd Street, Philadelphia, PA 19106 – presents “Trees of Life,” a small group Wistar hosts top winners of the 2018 Nikon Small World Photomicrography Competition. See captivating show featuring installation, paintings, photographs, sculpture and works on paper by Cynthia Back, Susan images from the 2018 Nikon Small World competition of photomicrography. These photographs taken through Benarcik, Frank DePietro, Linda Dubin Garfield and Amie Potsic January 4 - 27, 2019. A portion of sales microscopes will be on display at The Wistar Institute, with an opening reception on January 18, 2019. At will go to Tree of Life Synagogue in Pittsburgh, PA in memory of the 11 members massacred on October 27, Wistar, researchers look through microscopes and hypothesize over microscopic images with the goal of 2018. There will be a Closing Reception on Sunday, January 27, 2019, from 3 to 5 p.m. Gallery hours: advancing cancer and infectious disease research to develop future therapeutics. Winning photographers this Thursday and Friday 12 - 5 p.m. and Sunday from 12 - 4 p.m. or by appointment. Visit www.ocjac.org for infor- year are both scientists and artists possessing the consummate skill, scientific discipline and creativity for which the Nikon Small World competition is known. Small World spans 44 years as a leading, global competimation. Free and open to the public. Organized by www.smARTbusinessconsulting.org. tion for photomicrography. This year’s images were chosen from more than 2,500 entries from 89 countries. Wistar has been hosting the exhibit for more than 15 years. From January 21 through April 5, 2019, the Tune Up Philly Concert Tune Up Philly (TUP), the community engagement program of Philadelphia Youth Orchestra (PYO), directed top-20 images will be on view at Wistar and the exhibit is FREE to the public. The Wistar Institute is the only by Paul Smith, presents its opening concert of the season on Saturday, January 19, 2019 at 1 p.m. The young Pennsylvania venue to host these remarkable works of art. Visit https://www.nikonsmallworld.com/galmusicians will pay homage to traditional dances and folk melodies in this program. Art and culture will be com- leries/2018-photomicrography-competition and www.wistar.org. bined placing the students’ talent on full display. The concert will take place at The Temple Performing Arts Center, located at 1837 N. Broad Street, Philadelphia, PA. This is a free event. For info, call 215-545-0502. PROMOTE YOUR BUSINESS, SERVICE, OR EVENT IN CITY SUBURBAN NEWS! Call 610-667-6623 for Affordable ONLINE & PRINT Advertising Opportunities! THANKS FOR READING CITY SUBURBAN NEWS EVERY WEEK! Email your ad info, address & phone number to: citysuburbannews@mac.com WE GET RESULTS!!! * FIND A GREAT JOB * SELL YOUR HOUSE * FIX YOUR HOME * FIND EVERYTHING YOU NEED HERE! Call or email your advertising request by FRIDAY AT NOON for our next issue. Sign up for multiple weeks for advertising discount. 610-296-0560 S AY Y O U S AW I T H E R E ! ONLY $525 FOR 1X1 AD FOR ONE YEAR! CITY SUBURBAN NEWS Your Community Newspaper! FOR CLASSIFIED ADS IS FRIDAY AT NOON. 215-878-2727 www.darrenessenlocksmith.com Advertise Your Philadelphia & Main Line Area Real Estate Listings Here! PROmOTE yOuR BuSInESS In PRInT & OnLInE WITh LIVE LInKS TO yOuR WEBSITE! OnE LOW PRICE! SEnD An EmAIL WITh yOuR AD InFO. OR CALL 610-667-6623! Advertising deadline is the prior Friday by noon. ** OVERBROOK PARK ** 76xx Brentwood Rd – Renovated 3 BR, fin bsmt, mod kit, new bath, gar. . . . . . . . . . . . . . . . . . . . .$189,900. ** WELL LOCATED OFFICES ** 7300 City Ave – 820 sf & 1750 sf. Park View, includes all utilities, Reasonable! . . . . . . . . . . . . . . . . . . . . . . . . Thanks for Reading City Suburban News! AFFORDABLE ADVERTISING OPPORTUNITIES HERE! Reach Your Clients in City Suburban News! Publishing Every Wednesday PRINT & ONLINE. 34 Years of Loyal Advertisers & Readers. Let Us Help You Brand Your Business! Call 610-667-6623 or email: CitySuburbanNews@mac.com to reserve your space. We can easily email info and custom design your ad for FREE! ADVERTISE YOUR BUSINESS HERE! THIS 1X1 BOX AD FOR ONLY $525 FOR 1 FULL YEAR! LET US CUSTOM-DESIGN YOUR AD FOR YOU! I T ’ S E ASY & A FFORDABLE Reach Your Community! Advertise Your items for sAle Here! A DVERTISE H ERE E VERY W EEK ! Reach Your Clients Here! (1 column by 1 inch deep ad ONLY $10.50 per week PREPAID) Let us custom-design your ad. Larger sizes available. Send full payment or call with your visa or mastercard info. * FIND A GREAT JOB * SELL YOUR ITEMS * FIX YOUR HOME * FIND EVERYTHING YOU NEED HERE! Call or email your advertising request by FRIDAY AT NOON for our next issue. Sign up for multiple weeks for advertising discount. Public Notice NOTICE IS HEREBY GIVEN that the members of the Narberth Borough Commissioners will meet at the following dates and times in Council chambers of the Narberth Municipal Building at 100 Conway Avenue, Narberth, PA 19072. Finance & Administration meetings will be held every 3rd Wednesday of each month at 6:30 p.m. Planning Commission meetings will be held every 1st Monday of each month at 7:30 p.m. except for September which will be held on Tuesday, September 3rd at 7:30 p.m. Public Safety meetings will be held every 2nd Wednesday of each month beginning at 8:00 a.m.
1x/wk, detailed professional with 5 yrs. same employer exp. with verifiable recent refs. No CNA or HHA. No texts. Background check req. Recreation Board meetings will be held every third Thursday beginning at 7:30 p.m. Advertise Your Apartment or Home for Rent Here! GET RESULTS HERE EVERY WEEK! ADVERTISING WORKS! Let us help you reach your customers. YOUR AD IN PRINT & ONLINE. ONE LOW PRICE FOR ALL! Advertise Your Service in City Suburban News! Category:__________________________. MUST ATTACH AD COPY information to this form. (please print) Must receive ad and prepayment by noon Friday. All classified ads must be prepaid. Visa/Mastercard preferred. FAX this to: 610-667-6624 & we will call you for credit card. Advertise Your Job Listings & Business Opportunities Here! Find Something You Need Here! PROMOTE YOUR bUSINESS IN PRINT & ONLINE wITH LIvE LINkS TO YOUR wEbSITE! ONE LOw PRICE! SEND AN EMAIL wITH YOUR AD INFO OR CALL 610-667-6623! SCOTT BORISH PLUMBING, HEATING & PROFESSIONAL DRAIN CLEANING CALL US WITH YOUR PLUMBING OR HEATING PROBLEM TODAY! Advertise in CITY SUBURBAN NEWS! Heat & hot water included, hardwood flrs., elev. bldg., laundry room. Infrastructure meetings will be held every fourth Friday of each month at 8:00 a.m.
Environmental Advisory meetings will be held every 3rd Monday at 5:30 p.m. except for January which will be held on the last Monday of the month. our plumber knows his craft. 35 yrs. exp. 610-667-0101 Advertise Your Job Listings & Business Opportunities Here! Thanks for Reading City Suburban News. $13.75 Per Run (1 time) NOTHING! Call 610-667-6623. Find Great Info in City Suburban News! CITy SUBURBAN NeWS – Po Box 17, Bala Cynwyd, PA 19004 Say You Saw It in City Suburban News! Let Our Experienced Personal Care Attendants Meet the Challenges of Your Daily Needs. The Barbone Street Jazz Band performs at Tri-State Jazz Society’s concert at Community Arts Center, 414 Plush Mill Road, Wallingford, PA, on Sunday, February 10, at 2 p.m. Photo/Jim McGann Plush Mill Road, Wallingford, PA, on Sunday, February 10, at 2 p.m. Steve Barbone has been playing clarinet for nearly 70 years and has shared a stage with, among others, jazz legends Coleman Hawkins, Sidney Bechet and Thelonius Monk. With an appreciation for the musical styles he grew up and played as a young man, Barbone leads a roster of Philly’s best and most experienced dixieland/swing players. Accompanying Barbone are bandmates who have performed with Bobby Rydell, Frankie Avalon and Louis Prima, toured with Barry Manilow and Fabian, performed internationally and play regularly in the pit orchestras at the Walnut Street and Prince Music Theaters. This event will immerse attendees in the best of traditional jazz. Half-price admission of $10, payable at the door, is available for first-time attendees and members; general admission is $20; full-time students with IDs and children are free. There are no advance sales or reservations. The Arts Center is less than a mile from the Media-Swarthmore exit of I-476 and has free parking. For information see www.tristatejazz.org or call 856-720-0232. FREE One Day When you schedule 5 days. Brand Your Business by Advertising in City Suburban News! Call 610-667-6623 Today! searching for “Dine & Dish.” Dine & Dish is presented and organized by Leonard in partnership with The Bercy. Following the success of Leonard’s Tasty Talks, she approached Bercy owner Justin Weathers about this exciting new experience. She said, “The Bercy is the perfect setting to host intimate dinners sharing tales of inspiration and success. I love the food, the atmosphere, the service. I want to not only connect our community with amazing stories and speakers, but also a great night of food and wine on the Main Street of the Main Line in Downtown Ardmore.” Weathers added, “The Bercy is honored to host some of the biggest names on the Main Line. Dine & Dish will be an excellent opportunity for our culinary team to really roll out the red carpet and showcase an exceptional experience. We designed our restaurant with the goal of guests creating memories and sharing their stories over great wine and food – so Dine & Dish is the perfect pairing.” Following January’s debut with Dougherty at The Bercy, Dine & Dish will continue with Andrew Greenblatt, CEO of The Philadelphia Film Society, on Monday, February 25, and Marcus Allan, CEO of Big Brothers Big Sisters Independence, on Monday, March 25. The Bercy is located at 7 E. Lancaster Avenue in Ardmore. Complimentary valet parking is available on Station Road right off Lancaster Avenue. Celebrating 34 Years of Supporting the Arts! • The Prime Rib, 1701 Locust Street in Philadelphia, offer a 15 oz. Prime Rib for $25 through January 31. For reservations or info, call 215-772-1701 or visit www.theprimerib.com/philadelphia-pa. • Center City District Restaurant Week, through January 25, offers: Three-course lunch ($20) and Three-course dinner ($35). For a list of participating restaurants, visit https://centercityphila.org/explore-center-city/ccd-restaurant-week/list-view?cuisine=&search=lunch. Special Events • Philadelphia Museum of Art presents Antony Gormley: STAND, a Sculpture Installation on the East Terrace, from January 24 through June 16. Ten standing works, each about ten feet high, placed at regular intervals across the upper terrace. Find info at https://press.philamuseum.org/antony-gormley-stand-sculpture-installation-east-terrace. • Crystal Tea Room, 100 East Penn Square #9B in Philadelphia, is the venue for Metrospect Events’ Hair O’ The Dog, Saturday, January 19. Dance with T-Pain, DJ K Styyles, female DJ from NYC and Party Favor. Party-goers will enjoy open bar, gourmet stations, desserts and entertainment. Hair O’ The Dog benefits the Morris Animal Refuge, founded in 1874, America’s First Animal Shelter. For tickets or info, visit https://hairothedog.com/tickets. Submit event listings 2 weeks in advance of publication date to: jerry@jerrybloom.com. Follow paragraph format. “ROI, Real-time Or Instead – Works by Mark Price” Art Exhibit The Black Moth Gallery presents “ROI, Real-time Or Instead – Works by Mark Price.” This solo show will be on view February 1 - February 28. Mark Price’s silkscreen printed collage exhibition “ROI, Real-time Or Instead” features new and recent silkscreen printed collage works from artist Mark Price. Engaged with the silkscreen printing collage processes over the past ten years Price utilizes a self produced archive of printed imagery including optical patterns, found graphics, and gradient color fields that collage into rich and frenetic two dimensional compositions. The works explore where our psychological and information architecture become one. The resulting compositions operate as high-resolution experiences that attempt to map out a mediation of internalized and externalized information flows. The compositions address the possibility of a static image of today that encompasses our multi-modal experience with an ever-expanding built environment. Mark Price is a graphic artist who uses the silkscreen printing process to produce 2-D and 3-D visual works. Gallery hours are Tuesday through Sunday 12 - 8 p.m. The exhibit is free and open to the public. For info call 610-642-1500. Visit https://www.facebook.com/events/524011661418302/. 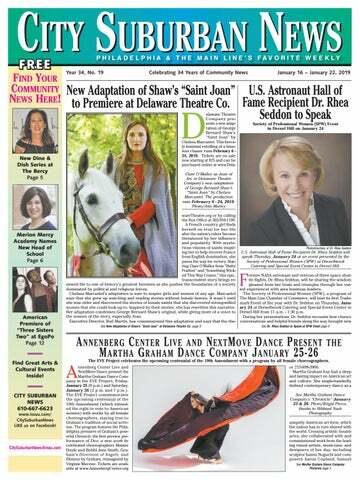 Read City Suburban News Online or Pick Up Your FREE Copy Today! Community News • Education • Healthy Living Arts & Culture • Senior Services • Events of Interest Dining & Entertainment • Classified • Plus More! Advertise in City Suburban News to Reach Your Customers! See the American Premiere of “Three Sisters Two” at EgoPo Classic Theater opening Friday, February 1 at the Latvian Society Theater, 531 N. 7th Street, in Philadelphia. www.issuu.com/CitySuburbanNews or LIKE us on facebook for online issues. UPCOMING SPECIAL ISSUES: January 23 – Healthy Living, Get Ready for Valentine’s Day January 30 – Get Ready for Valentine’s Day February 6 – Education News, Get Ready for Valentine’s Day, Get Ready for Camp February 13 – Healthy Living February 20 – Education News, Get Ready for Camp Find Dining & Entertainment News Every Week! Call 610-667-6623 for details. Deadline previous Thursday. CITY SUBURBAN NEWS – Your Community Paper for 34 Years! Montgomery County author Donna Cavanagh presents her new book “How to Write and Share Humor: Techniques to Tickle Funny Bones and Win Fans” at a book launch party on Sunday, July 10, from 1 p.m. to 3 p.m. at the Trail’s End Café, at the Cynwyd Train Station, at 375 Conshohocken State Road. One-Act Bonanza Old Academy Players’ 2016 Summer includes “He Said, July 8, 9, 10, 15, 16, & 17, 2016, Jane Jennings, Dale She Said.” Shown are, top row – – Meredith Mitchell, Mezzacappa, director; front row Matthew Thompson, Angela Robb. n this dark comedy, Reza de Wet weaves together a collection of Chekhov’s iconic characters into a single musing on the end of a world. On February 1, EgoPo Classic Theater presents this great South African playwright’s take on Anton Chekhov’s classic, twenty years later, during the fall the privileged society. Three Sisters Two previews January 3031 and opens Friday, February 1. The show runs three weeks, closing February 17. Tickets range $25-$35. Performances are at the Latvian Society Theater at 7th & Spring Garden, in Philadelphia. EgoPo’s boldly themed seasons continue with this year’s Theater of South Africa, celebrating great dramatic works from the country’s rich theatrical tradition. By telling these stories, EgoPo honors the profound moment in world history when apartheid came to an end, and hopes to provide new perspectives on racism and social justice in our own country, while highlighting a diverse community of Philadelphia artists. Theater of South Africa began with EgoPo hosting a South African version of the American classic, Desire Under the Elms, followed by the powerful A Human Being Died That Night, which looked at the process of forgiveness and reconciliation. EgoPo continues with Three Sisters Two, which looks at how the world feels as the status quo is challenged, and concludes with CENSORED: A rotating repertory of two banned South African plays featuring “Master Harold”…and the Boys by Athol Fugard and Egoli by Matsemela Manaka (co-produced with Theatre in the X), shining a light on two vastly different experiences under apartheid. Subscriptions to see all three spring plays are just $60. For information, go to www.EgoPo.org, or call 267-273-1414. Reza de Wet is one of South Africa’s most celebrated playwrights with over 40 theater and literary awards. She is the country’s top female playwright and considered, alongside Fugard, to be a leading voice of South African theater’s apartheid resistance. She is also unique for writing throughout her life in her native Afrikaans, despite English being the more popular language of publication. In her later plays, de Wet began to channel Chekhov, re-writing his plays for a contemporary audience and bringing him to new life. In her darkly comic Three Sisters Two, de Wet weaves together a collection of Chekhov’s iconic characters into a single musing on the end of a world. As war closes in around them, and the threat of restitution hangs in the air, a once-privileged family clings determinedly to their fading life. EgoPo regular Brenna Geffers (Anna, Machinal, The Hairy Ape) will direct the American Premiere of this piece that The Telegraph of London called “a play that combines wit with deep feeling” and continued, “Any fan of Chekhov will want to see this imaginative and often extremely touching sequel.” Winner of Best Production of the Year at the 1999 South African Theater Awards, the play has also been produced in England, The Netherlands, and Czechia. EgoPo is excited to present an all-star cast of EgoPo favorites including Ross Beschler (Delirium, Machinal, Hell), Andrew J. Carroll (Lydie Breeze Trilogy, Anna, The Seagull), Colleen Corcoran (Anna, Machinal, The Hairy Ape), Maria Konstantinidis (Company, Anna, The Hairy Ape), Lee Minora (Machinal, The Women, The Hairy Ape), Kishia Nixon (The Children’s Hour), Amanda Schoonover (Anna, The Hairy Ape, Jesse James), and Jahzeer Terrell (Lydie Breeze Trilogy). The artistic team for EgoPo’s Three Sisters Two includes Set and Lighting Design by Thom Weaver (The Seagull, Machinal), Costume Design by Natalia de la Torre (Anna, Delirium, Jesse James), Sound Design by Chris Sannino (EgoPo debut), Prop Design by Em Arrick (EgoPo debut), and Stage Management by Jamel Baker (Lydie Breeze Trilogy, Anna, Delirium). Three Sisters Two will be staged at the Latvian Society Theater, 531 N. 7th Street, in Philadelphia. Previews begin January 30, with Press Opening on Friday, February 1; the show will run three weeks, closing on February 17. Tickets: Wed. - Thurs. : $25, Fri. - Sun. : $32, Opening Night: $35. Visit www.egopo.org or by phone at 267-273-1414. Standard ticketing fees apply. The Economic Forecast Breakfast is the area’s premier event for business leaders to gather and discuss current events and to receive expert advice on the current economic climate of the Main Line, the Commonwealth and the nation. The featured content on Thursday, January 31 at The Desmond Hotel in Malvern will be an engaging interview with economist Mark Price of the Keystone Research Center, a nonpartisan organization that conducts original research and promotes public dialogue that addresses important civic problems. The morning will also draw attention to the Foundation’s work providing college and training scholarships to volunteer firefighters and emergency medical technicians throughout Delaware, Chester and Montgomery Counties. These volunteers show up when we need them most. For information visit www.mlcc.org. Every Wednesday Pick Up Your FREE Copy of CITY SUBURBAN NEWS!